Here i am sharing success story of one of our alumni Udita Chandola. Now she is working in Quintiles IMS in Gurugram. She did M.Sc Biotechnology and Bioinformatics from IGNOU Bangalore with 72 %. She was previously a Project Officer, School of Biological Sciences (SBS), Nanyang Technological University (NTU), Singapore Inactive X chromosome research, Translational studies, developing diagnostic high throughput method for Thalassemia, acquiring samples and lab maintenance. 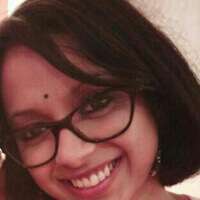 She was a trainee at GANIT Labs, IBAB, Bangalore, India DNA and RNA Methylation studies in correlation with Oral Squamous Cell Carcinoma (OSCC), data generation, experimental design and optimization. Today she is successfully placed in QuintilesIMS, world’s leading Healthcare Firm on the post of Patent Analyst with very good salary package and she is performing well at her job. Udita gives most of the credit of her success to her parents and IIPTA team who always remained very supportive. She dreams to fulfill her parents expectations. Here’s wishing her all the very best for her future endeavors.